I'm pretty sure Julie Andrews would have to change her underwear after seeing these pictures. 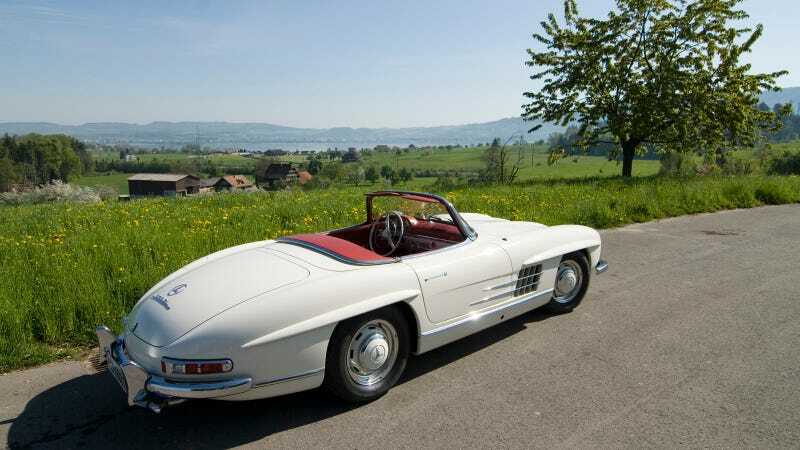 I know for a fact that my pants are alive with the sound of this alpine 1960 Mercedes-Benz 300SL roadster. Sploosh. It's hard to find a bad angle on this Mercedes Gullwing-minus-the-gullwings roadster, and the setting just makes us want to lope up to some twisting pass, big three-liter six thrumming away. The flatterer behind the camera is Denis De Mesmaeker, who has a few other sets of gorgeous classic cars on the same road. We put a few of our favorites of this über Benz in a gallery and you can click on the "Expand" button in the lower right of each picture to see them in 1600px-resolution. If you want them in giganto-desktop size, just click over to De Mesmaeker's set on Flickr.